To serve young children by providing a developmentally appropriate curriculum which enhances self-esteem, promotes problem-solving skills, and fosters healthy emotional, social, ﻿physical, language and intellectual growth. Our program helps build a community of active, engaged learners and families. Our teachers use an intentional cycle of teaching. First they develop an “emergent” curriculum by observing and recognizing the interests and needs of the children – as individuals and as a group. Then they implement the weekly “learning experience plans” and record children’s progress. Finally, data on children’s performance and more wonderful ideas from the children influence the next round of planning. Our teachers use the State of Connecticut Preschool Frameworks and National Association for the Education of Young Children’s (NAEYC) accreditation standards as guides for planning. 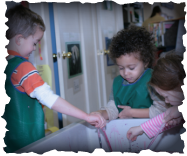 The CT Preschool Frameworks and the NAEYC standards support children in all areas of development including personal/social, physical, cognitive (language and logico-mathematical), and creative expression, ensuring that we teach the “whole” child. Community is at the heart of everything that takes place at WCNS. The school is dedicated to serving not just students, but their families as well. Many activities occur during the school year offering a wide variety of opportunities for families to support the school, each other and the greater community. The school sponsors many events to foster new relationships among families and staff. Families are an integral part of WCNS. 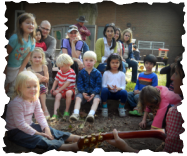 WCNS welcomes families in the classroom and values the talents, interests and resources that families and friends have to share: whether to read a story to a small group of children, cook with the children, teach yoga, share a custom or tradition, or play a musical instrument. WCNS has a working Board of Directors that is made up of current and alumni families. All families are asked to be a partner in their child’s education by participating in the program. We are a network of teachers, students and families committed to quality preschool education and to the larger New Haven community. Learning Through Play from Lee Faulkner on Vimeo. WCNS, Inc. is a 501(c)(3) non-profit organization. Donations may be tax deductible; consult your tax advisor.